Lighting-Gallery-net - Miscelaneous Lamp related stuff/E39 cap fastened by the G.E. "Crimp-Shell" technique. E39 cap fastened by the G.E. "Crimp-Shell" technique. 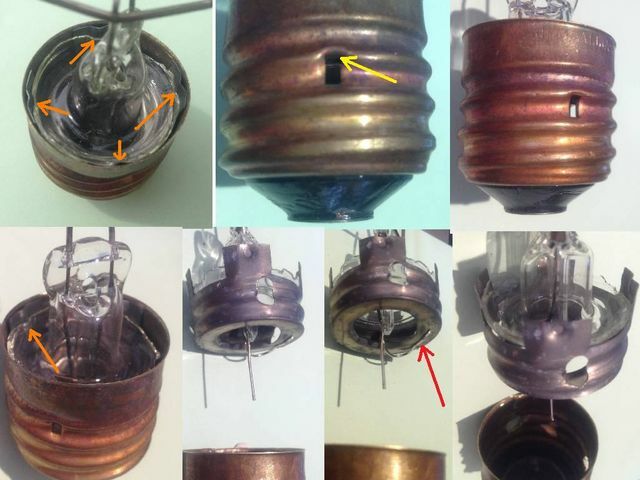 This patented technique was one of the first "cementless" techniques used for attaching the bases to lamps and developed by G.E. in the late 1930's or early 1940's I think...so it has been around a while. Basically it involves pushing a four-fingered sub-shell onto the specially molded bulb-neck where domes on each finger snap into dimples molded into the neck. Once this is done, one lead-in wire is spot-welded to the sub-shell to make the electrical connection. Lastly the E39 cap is screwed-on over the threaded part of the sub-shell and three rectangular holes a punched through the sides by a special triangular tool that curls burrs in at the top and bottom edges of each hole, this crimps the cap in place...AND hence the name, "Crimp-Shell"
For a lamp collector, these details are important. because, although two lamps may bear the same type number and be functionally the same with regards to the desires of the end-user, differences like base attachment allow the lamp to be provided with a precise providence and chronology of development. In a serious lamp database, one should provide a field for such details. This is actually quite an old design, developed by GE in 1929 - see US Patent 1,832,751. It is cheap and easy and does not easily come loose, but the stresses placed on the glass are not always desirable - the glass has to be quite thick and may still crack. A generally better solution is the mix of green and white striped capping cements used by some other manufacturers, with two different cement kinds having different thermal and mechanical properties. I knew this was an old design...I had seen it described in the famous 1930 Mazda Lamp Bulletin! Interesting that it was already ten years old at that time and obviously originally used on incandescent lams. Most of the lamp types I have with this fastening technique are H.I.D., although I do realize that in the North American Realm there are probably still quite a few incandescent examples about. Interesting about the stresses it puts on the glass, do they primarily arise from dimensional changes due to thermal cycling or from the torque applied during insertion and removal of the lamp from the socket. Capping cements have always interested me as they are one of the most mysterious parts of the lamp...from an understanding down to the atomic level, another being badging paste! The stresses on the glass are mainly in the axial dimension, from thermal expansion mismatch. To minimise this the crimped bases are often deliberately made a little bit of a loose fit. Capping cements and etching inks were developed almost completely by trial and error methods over many decades, mainly by one engineer, J. LeRoy Dana at GE's Euclid lamp plant. When they hit on a good formula, the same recipes were kept for decades, even a century in some cases. As such the chemical compositions are often most unusual and call for ingredients and preparation methods that are not so common today - hence they are mainly still prepared in the chemical labs of the lamp companies themselves. So more a recipe than a formula!